The NASA shuttle Endeavor launched last month with a bit of BYU onboard. A team of faculty and students designed a specialized circuit for the spacecraft. 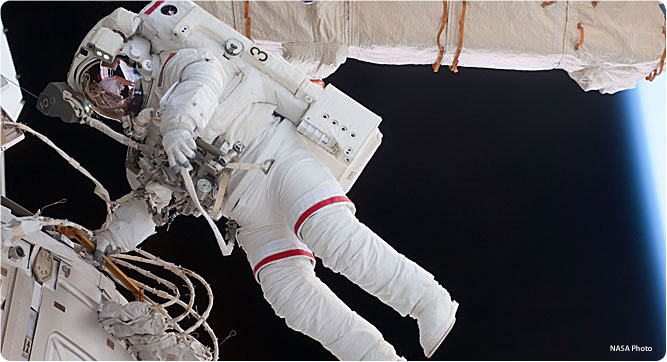 See how the BYU circuit saves astronauts time in space. The art of BYU assistant professor Ryan Woodward danced across Google's homepage May 11 to celebrate acclaimed choreographer Martha Graham. In May the BYU men's rugby and lacrosse teams competed in national championships. While rugby fell in Rio Tinto Stadium, lacrosse claimed a national title. South campus features a newly renovated half-mile trail and stream that are a restored version of BYU's late 1800s trail and stream--plus five waterfalls. Fifty years ago the entire U.S. World Figure Skating Team died in a plane crash. Former competitive skater Patricia Bushman (BA '78) honors them in a new book. Radboud University's Herman Teule will speak on June 22 about Christians in contemporary Iraq. Check the video archive later this month for a visiting Hebrew scholar's June 1 lecture on forensics in ancient Near Eastern courtrooms. Integrating computer data into your 3-D life, augmented reality could help you fix your car, create 3-D books, and more. Special education faculty Betty Ashbaker helped write a "Texty"-winning book about working with autistic children. BYU students chatted with local principals over dinner, getting an insider's view of the education profession. See the science-fair projects that won big money at the 2011 Central Utah Science and Engineering Fair, hosted at BYU. Check out the online version of the spring 2011 issue of Connections, the college's alumni magazine. Two political science students' papers on European policy will be published. One of the students won a trip to Belgium. Political science professor Earl Fry was honored with the Fulbright Bicentennial Chair at the University of Helsinki. The International Cinematographers Guild recognized BYU's theatre and media arts program as one of the nation's best. The American College Dance Festival selected BYU's Contemporary Dance Theatre to perform two dances. See video of Drag, the paratrooper piece that won Best of Show in the Visual Arts Student Show. After 27 years coaching famous artists and BYU students, the associate director of Young Ambassadors is retiring. Brian Jensen is the third BYU mechanical engineer in two years to win the National Science Foundation's CAREER award. Going from 0 to 60 mph in three seconds, BYU's hybrid racecar took second in an international race--and it gets 42 mpg. With a Department of Defense SMART scholarship, grad student Ken Langley will study flow fields in ladybug flight. See what two mechanical engineering grad students--both recipients of U.S. Department of Defense fellowships--are researching. Read former academic vice president John Tanner's essay about taking life's journeys beyond the normal limits. BYU philosophy chair Daniel Graham's new work on early Greek philosophy was praised by the Times Literary Supplement as a monumental feat. A BYU team published research on how HIV evolved differently in a set of twins, as well as two other studies about the virus. At the college's spring convocation, life science graduates were admonished to prepare to serve and to cherish their spiritual experiences at BYU. Passionate about cadavers and teaching, human anatomy assistant lecturer Rachel Tomco passes that love on to hundreds of students. In her last lecture, JoAnn Abegglen shared lessons she learned while teaching at BYU. Read excerpts from her lecture. A group of BYU nursing students were voted Volunteers of the Month by Provo's Food and Care Coalition. Holly Skelton, administrative assistant to the dean, has received the President's Appreciation Award. A national nursing convention held in Salt Lake City allowed more BYU students a taste of issues in the field. BYU Astrofest featured rocket building and telescopes--plus that morning four planets were grouped together in the sky. A team of BYU geology students dominated a regional quiz competition, taking home top honors. In a university forum, associate dean Tom Sederberg explains his invention for fixing leaky tea pots, airplanes, and the like. Student Terik Daly, recipient of the Barry M. Goldwater Scholarship, is studying impact craters on a micro scale. This year's Strengthening the Family Symposium is in need of volunteers and participants. Get involved. Hear the university forum address given by Professor John Welch, the 2010-11 recipient of BYU's highest faculty honor. The BYU Faculty Women's Association honored professor Kif Augustine-Adams with its teaching award. Two BYU representatives traveled to India to participate in a conference about religion and the government. Five MBA students received $10,000 Eccles Scholarships to explore global business careers. The Merrill J. Bateman Award is the only school-wide award selected entirely by students. See the results. Six BYU information systems students dominated a recent competition in Florida, taking home three first-place finishes. Faced with the challenge of creating innovative solutions to social concerns, several students turned to fish and took first place at a competition. Chad Nielsen teaches science with "stupid mnemonics" and comedic dancing. A new BYU series airing Thursday nights at 7 proves that everyone has a story. Two new Religious Studies Center books can help you delve into Church history. Hear Shanti Rose and two other students express appreciation for their BYU educations.